The setup for this shot is a simple rose placed on black Plexiglass with two white foam insulation boards enclosing the background. Single light source in a 36-inch softbox to camera right. The light consists of only the modeling lamp as the trigger cord for the strobe was disconnected for this shot. Enjoy and please, let me know what you think in the comments below. 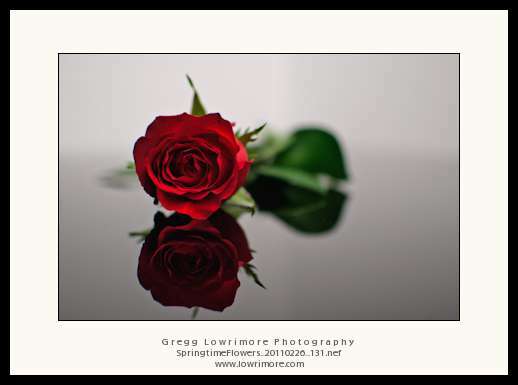 Posted in Fine Art and tagged reflections, rose, spring, studio by greggl with no comments yet. 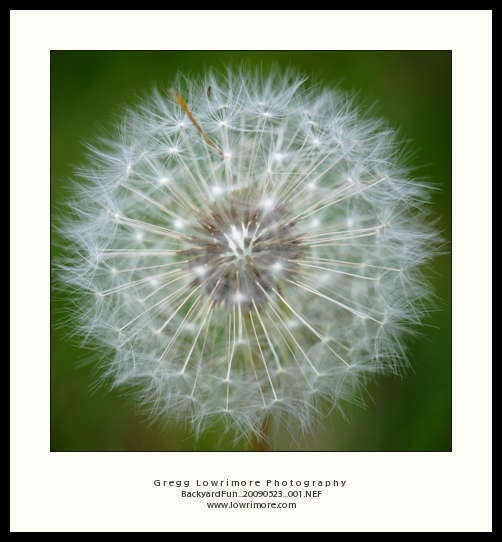 Posted in Fine Art and tagged dandelion, green grass, spring, weed by greggl with 2 comments. Posted in Landscapes and tagged grass, panorama, robin, spring by greggl with no comments yet.